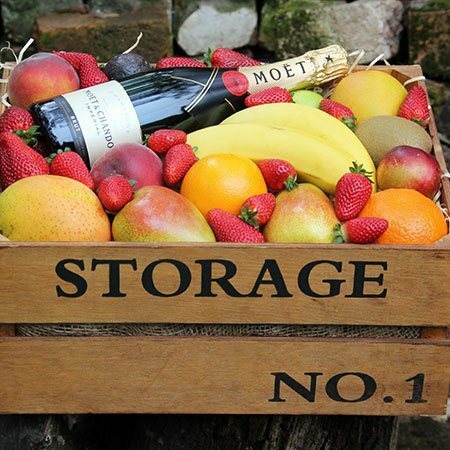 Send a delectable Xmas hamper brimming with tropical mangos, popular seasonal stone fruit and a quality bottle of sparkling Moet. Fresh, delicious and beautifully presented, our florist team have designed this hamper in a rustic timber crate. Ideal for either an individual or an office to share, order our Xmas fruit and wine hamper online or phone the Flowers for Everyone team toll free on 1800 66 66 46. *Please note: Orders need to be placed prior to 12 Noon for same day delivery. The pictured fruit and wine hamper is available for Sydney only. For hamper deliveries outside Sydney, please phone our florists on 1800 66 66 46 or email sales@flowersforeveryone.com.au to coordinate a similar gift via an affiliate florist network. Order five or more of these Christmas hampers for staff or clients this season and receive $36 off their retail price. To arrange, simply call our team on 1800 66 66 46 or send us an email. Applies to new orders for Sydney delivery only, up until Xmas eve. Not valid in conjunction with other discounts.